I havent found any yet but it has been very dry. Rained yesterday so I'm going to head out tonight and see if I can find any. Re: How is the mushroom hunting going? You should have em down there as I was up to Wolverine today and Greg and family are finding them up there. VERY EARLY! Yesterday was a great day for mushrooms here in western Illinois. We went out and found a good bunch. About 10 minutes before dark, we were about ready to head back to the house. One of our group had a sweatshirt around here shoulders and it fell off. Fell into a patch of mushrooms and we found about 30 more in a matter of minutes. It got so dark we couldn't see and we went to the house for a supper of mushrooms and hamburgers. This morning I went back and found 12 more in that one spot. It has been raining and hot around here and I expect tomorrow to be a pretty good day. Unfortunately, early this morning was the only time I had, not chance to go out this afternoon. This hasn't been the best year ever, but it has been better than average. I found two last night. Both of them seem a little "old" like the time is almost past. I plan on looking again tonight. We were at the Cabin in Eastern WV last week. Harvested about 1/2 pound Black Morals with a couple of whites thrown in for contrast. I fried last winters white tail backstrap and made angel hair pasta with butter, garlic and shrooms. Jon, you should of posted a warning that no one should read your post if they are hungry. I was practically drewling when I got done reading. And be careful out there. We have three folks in the hospital out here who ate a mess of what they thought were "safe" mushrooms. As one old boy put it, "all mushrooms are edible, some only once"
My nephew went picking today,usually if you can get a few dozen that is a good haul but he got a 5 gallon bucket full,said they are everywhere this year . It's been cool and on the wet side here . He brought me these tonight . They aren't everywhere, UB. I and my spouse were out wandering the woods yesterday checking out all of the dead elms. Didn't find a single morel. I usually have the worst luck finding Morels. I had pretty much given up on finding any on our property. I thought of one place I hadn't looked because I thought the soil would not be sandy enough. There were 15 big Morels around 2 dead elms. Now my only problen is the 2 elms are going to be cut down this summer. Will the Morels still grow around the stumps? We call them sponge mushrooms in Illinois. Some of those look like pecker heads though. I really only see one morel (sponge). 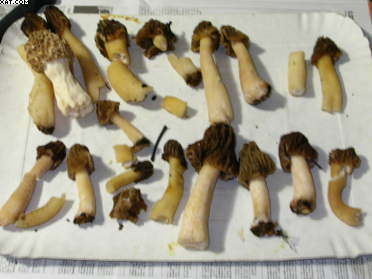 DoubleD, all but one of those in your pic we call false morels and Don't eat, did you eat 'em yet? I went out today and found a few handfulls, was a dry spring, but now we're getting a bunch of rain, should be good year for morels. Yes, they appear to be "false" morels and shouldn't be confused with "true" morels. These will make one sick if eaten!! Some "true" morel mushrooms, even these can make one sick at times if they eat too many.